Condition: Fine condition, refinished. Some bleeding to the original wrought nails. 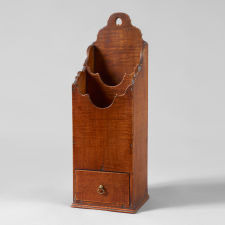 This rare two stage pipe box has a wonderful cut-out shaped back with a heart-form hanger above stepped down compartments with carved shaped edges above a drawer with fine dovetail construction. Some bleeding to the original wrought nails.